There are certain game themes which endure – hell, themes which endure throughout popular culture – like horror, ancient history, and sci-fi. The fantasy genre continues to draw audiences in, whether it’s the Lord of the Rings movies or the shag-tastic adventures of Game of Thrones on TV. And when it comes to fantasy-inspired slots, developers usually nail it. IGT’s roleplaying-themed slots based on the legendary game, Dungeons & Dragons and the superb follow-up, Dungeons & Dragons: Crystal Caverns, showed what you can do with a theme that offers tonnes of possibilities. 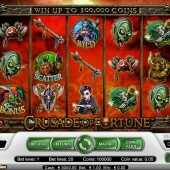 Exciting and innovative slot developer NetEnt’s Crusade of Fortune ably adds to the growing roster of fantasy-inspired games which should appeal to video slots fans and LOTR geeks alike. 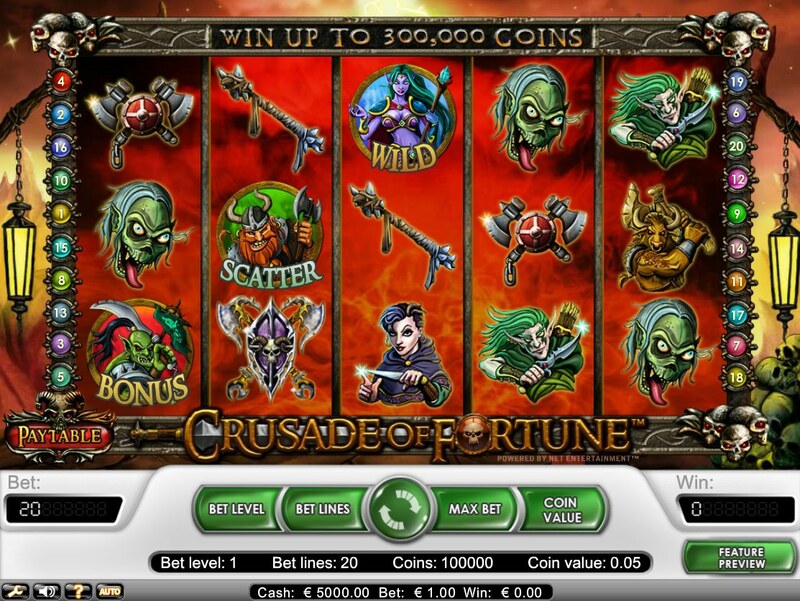 A 5-reel, 20-payline online slot, Crusade of Fortune has some nice features, friendly betting starting at just $0.01, and whopping payouts. In fact, the game boasts a top jackpot of $60,000 – more money than you can shake a broadsword at. If you’re a roleplaying fan the reels are filled with everything you’d expect from a slot based on Middle Earth – bearded dwarves, Elven temptresses, witches, wizards, and all the apparel that comes with them, like battleaxes, shields and hammers. There’s a little animation involved when you hit a winning combo and the reels spin with a nice trail of fire down the reels for added effect. The purple-skinned elf witch acts as the game’s Wild, and substitutes for all symbols other than the bonus Scatters. Five Wilds across the reels awards a 5000-coin jackpot. The axe-wielding dwarf, meanwhile, awards free spins when three or more of his little bearded fizzog appears on the reels. You'll win 10 free spins with three icons, 20 free spins with four and 30 free spins with five icons. Not only that, but all spin wins receive a 3x multiplier. The game’s main bonus feature occurs when hitting three or more bonus Orc symbols on an active win line. I found this cropping up fairly regularly when I played, so it could prove to be fairly fruitful for you if you persevere. You’ll be taken to a fighting arena where your hot female warrior gets to go three rounds against the green Orc nasty. For each round simply choose an attacking move and a defensive move, and if you land a blow – or successfully block Mr. Orc’s lunges – you’ll win cash. With some really nice wins, a neat bonus feature, and a genuinely broad range of betting sizes on offer, Crusade of Fortune should be a slot you make a special mission to find. Now where did I leave my battleaxe?